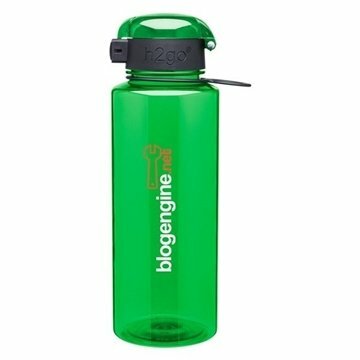 28 oz single wall (BPA-free) Eastman Tritan™ copolyester bottle with one-touch push-button flip lid and carrying loop - patent #D571,147. I'm very happy with it overall. Great item. Everyone liked it. It's durable and good quality(color). Very nice. Decent weight, and the image came out nicely. It's perfect. Everything went through rapidly via internet/email. Alicia was very helpful and responsive and walked me through the entire process.I will definitely be in touch with her for our next promotional order.